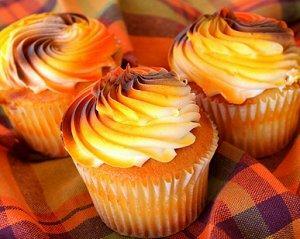 Fall colors look great on cupcakes. 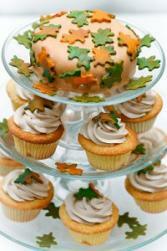 Fall themed wedding cupcakes are a beautiful alternative to a traditional wedding cake. You need not sacrifice taste, style, or creativity for this highly anticipated wedding dessert. Decorative cupcake designs for a fall wedding are endless and include fondant and a splash of air-brushed autumn colors. Wedding cupcakes are becoming more and more popular with couples for a variety of reasons. Cost: Depending on the flavor, quantity, and decorations, cupcakes can be more affordable than a traditional tiered wedding cake. While very elaborate cupcakes will be more expensive than a simple wedding cake, couples who choose cupcakes often save quite a bit off their wedding cake budget. Ease: Cupcakes are easier to bake and decorate for couples who want to make the wedding dessert themselves. They are also easier to arrange in tiers for attractive serving and do not require as much setup or cleanup as a wedding cake. Flavors: Instead of choosing just one flavor for a wedding cake, or even one for each tier, couples can opt for several different flavors of wedding cupcakes without difficulty. This is especially good if a couple's wedding menu must accommodate different dietary needs such as diabetic, kosher, and gluten free requirements. Couples who choose wedding cupcakes do not have to sacrifice decadent flavors, elegant decorations, or stylish presentation because they're not having a traditional fall wedding cake. In fact, many couples have so many ideas for fall cupcakes that narrowing down the choices can be a challenge. 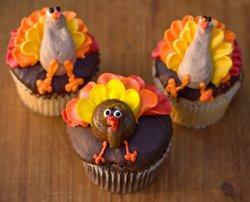 Try turkey cupcakes for a Thanksgiving wedding. It is also easy to fill wedding cupcakes with cream or ganache, adding extra decadence to this rich treat. A top tier can be cut. The wedding cake is undoubtedly one of the most photogenic decorations of a wedding, and it is important that wedding cupcakes be presented in a beautiful way. Specialized cupcake stands are available, or tiered dessert serving trays can be used to add a touch reminiscent of a tiered cake. Many couples also choose a simple stand that has steps or ledges resembling the tiers of a wedding cake that will hold rows of cupcakes. The cake table should also be decorated to match the theme of the wedding cupcakes. Loose colored leaves can be scattered over the table, and autumn hued table linens can make a striking display. Fall leaf garlands draped around the table also add to the theme beautifully, and candles add warmth and romance to the scene. Couples interested in fall wedding cupcakes but who still want a more traditional cake for cutting may consider a small, single tier wedding cake at the top of the cupcake stand. That tier can be cut and served either just for the couple or for the entire bridal party, while cupcakes in various flavors are available for the guests. Many couples also consider wedding sheet cake as a cupcake alternative if they prefer a more traditional cake style without a formal tiered cake. Fall wedding cupcakes can be both beautiful and delicious, with the added benefits of affordability and convenience for couples to enjoy. Whether you are planning a formal fall wedding or a more casual autumn affair, cupcakes can be a tasty part of it.